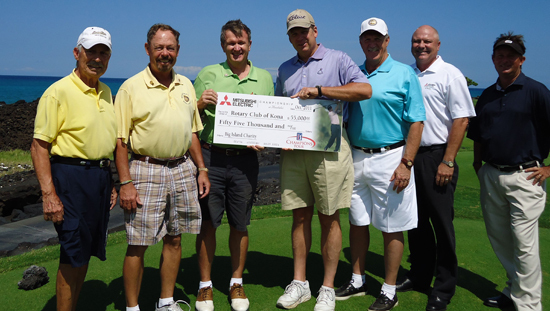 Tournament officials from the Mitsubishi Electric Championship at Hualalai have presented charitable donations to the Rotary Club of Kona and the Big Island Junior Golf Association. On hand to present the checks, courtesy of the January 2011 event January, were Mitsubishi Electric Cooling & Heating (HVAC) Senior Vice President and General Manager Bill Rau, HVAC Vice President of Sales Bud Nardello, John Freitas, General Manager of The Hualalai Club, Brendan Moynahan, Director of Golf and Tournament Manager Kelly Fliear. The presentations were made on the 18th green at the pristine Hualalai Golf Course, designed by Jack Nicklaus. The Rotary Club of Kona has played an integral role in managing the tournament volunteer corps since the tournament began in 1997. Each year, more than 400 volunteers contribute their time, talents and Aloha Spirit in servicing the players, sponsors and spectators at the Hualalai Resort to ensure a successful event. A check for $55,000 was presented to Rotary Club of Kona President Mike Kelly, who pledged the funds to community projects and college scholarship grants for selected students. The Big Island Junior Golf Association, with more than 100 members, benefits from a national program on the Champions Tour which financially supports junior golf in the city or region where official tournaments are played. The Champions Tour players voted to forego the $5,000 Pro-Am purse they shared in years past and donate that money to the BIJGA. In addition, Mitsubishi Electric Cooling & Heating continues their support of the Big Island Junior Golf Association as a year-round corporate sponsor and provides each golfer with team shirts they wear during competitions. Mitsubishi Electric enters its fourth year as title sponsor of the Champions Tour’s season-opening event, continuing to elevate the event on a worldwide scale in the state of Hawaii and the Big Island community. “Mitsubishi Electric, in concert with the Champions Tour, is very proud of the charities this outstanding tournament benefits,” offered Katsuya Takamiya, president and CEO of Mitsubishi Electric US. “On behalf of the Champions Tour and local tournament staff, it is with great pleasure that we present charitable contributions to the Rotary Club of Kona and the Big Island Junior Golf Association,” said Mitsubishi Electric Championship Executive Director Brian Goin from PGA TOUR headquarters in Ponte Vedra Beach, Fla.
“Since the tournament’s arrival on the island in 1997, over $900,000 has been raised for local charities as a result of the tournament and player-related fundraisers. We would also like to extend a sincere thanks to Mitsubishi Electric, the Hualalai Resort and the Hawaii Tourism Authority for their partnerships and to our dedicated volunteer force for helping make this event possible each year,” Goin said. The 2012 Mitsubishi Electric Championship at Hualalai is slated for Jan. 20-22, preceded by the official tournament pro-am scheduled for Jan. 18-19. John Cook, who has captured three titles already in 2011, is the defending champion. The Champions Tour is a membership organization of professional golfers age 50 and older. Conceived in 1980 as the Senior PGA Tour, it started with just four events and purses totaling $475,000. Points earned in official Charles Schwab Cup events in 2011 will determine the Charles Schwab Cup champion, the season-long competition designed to recognize the Champions Tour’s leading player.